From 1917 to 1954, streetcars on the Madison Avenue line ran from downtown Cleveland to Spring Garden Avenue in Lakewood. 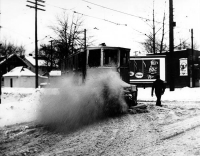 Here, a Cleveland Transit System electric snow sweeper clears the way at the end of the route after a heavy storm in 1951. Photograph donated to the Lakewood Historical Society by Bruce Young.